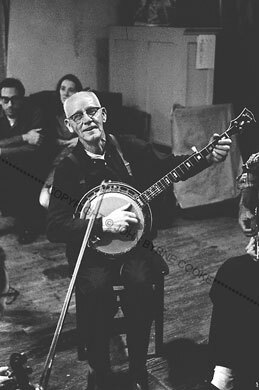 Harry Smith included two of Clarence Ashley's early recordings on his Anthology of American Folk Music ("The Coo-Coo Bird," 1929, and "The House Carpenter," 1930). In 1960, Ralph Rinzler had to persuade Clarence, who was called "Tom" by his friends, that people in the cities really wanted to hear the old-time music before Ashley would pick up his banjo again. None of the "rediscovered" traditional musicians had more fun in the folk music boom than Tom Ashley. Here, he's playing in a loft party in Greenwich Village after a concert.